Welcome to the September edition of the Inclusive Growth Bulletin, the newsletter produced by the International Policy Centre for Inclusive Growth (IPC-IG). The highlight of this issue is the must-read new issue of the Policy in Focus magazine, titled “Minimum wage: global challenges and perspectives”. We also bring you new publications on topics such as the social protection system in Mozambique and two new entries in the ongoing series of One Pagers focusing on non-contributory social protection programmes in countries of the Middle East and North Africa (MENA) region, featuring Qatar and Saudi Arabia. The new issue of Policy in Focus, titled “Minimum wage: global challenges and perspectives” debates the implementation of minimum wage policies and their effect on poverty reduction, inequality and inclusive growth worldwide, as well as their downsides, current trends and policy design issues. Since its creation 124 years ago, the popularity of the minimum wage among policymakers and the public at large has risen and fallen. Currently, more than 90 per cent of the world’s countries have minimum wage laws, according to the International Labour Organization (ILO). Despite that fact, global inequality has increased over the last decades. As inequality can hinder economic growth, reduce well-being and increase poverty, great attention has been given to the role of fiscal redistribution (or lack thereof) in the inequality debate. In that light, mechanisms that involve money passing directly from one economic agent to another, rather than through the hands of the State, deserve more attention. Read more here. In the Working Paper "Mozambique’s social protection system: an overview of the Basic Social Subsidy Programme (PSSB), the Direct Social Action Programme (PASD), the Productive Social Action Programme (PASP) and the Social Assistance Services (PAUS)", Pedro Arruda (IPC-IG) analyses the four main social protection initiatives currently in place in the country. 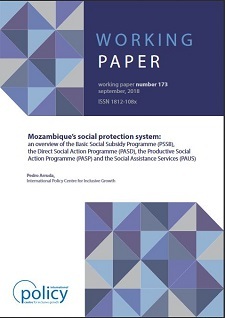 He provides a description of the institutional set-up of Mozambican social protection and discusses the core features of each of these social policies, while assessing the scale of the programmes and how they relate to each other. The paper concludes by recalling previous critiques regarding the excessive number of categorical criteria mediating eligibility for these initiatives. This publication is available in English, and an accompanying One Pager is available in English and Portuguese. In the Working Paper "From income poverty to multidimensional poverty: an international comparison", the authors Francesco Burchi (German Development Institute - DIE), Nicole Rippin (DIE), and Claudio E. Montenegro (The World Bank) seek to improve the current methodology of measuring multidimensional poverty and to more consistently analyse its relationship with income-based poverty assessments. This publication is available in English and an accompanying One Pager is available in English and Portuguese. Previously released One Pagers in this series include: Algeria; Bahrain; Djibouti; Egypt; Iran; Iraq; Jordan; Kuwait, Lebanon, Libya, Morocco and Oman. Find them all here, sorted by language: Arabic, English, French and Portuguese. For further information and critical articles featuring diverse perspectives on social protection in the MENA region, we suggest reading the December 2017 issue of the Centre’s flagship magazine, Policy in Focus, titled "Social Protection after the Arab Spring", available in Arabic, English and French. We also recommend the Working Paper "The role of zakat in the provision of social protection: a comparison between Jordan, Palestine and Sudan", in which authors Anna Carolina Machado, Charlotte Bilo and Imane Helmy (IPC-IG), explain the relationship between zakat, one of the five pillars of Islam which can be considered a religious duty for wealthy people to help those in need through financial or in-kind contributions, and social welfare. It's available in English, and an accompanying One Pager is available in Arabic, English and Portuguese. On 12 September, socialprotection.org celebrated its third anniversary, going from strength to strength and presenting new features. Since its launch in 2015, socialprotection.org has brought together almost 3,600 members, 945 stakeholders, and directed access to nearly 3,700 publications. It has organised 73 webinars, hosted five online courses, and is home to 40 online communities, 10 of which are currently active. The platform is available in English and French and was recently launched in Spanish. (We invite you to click here to register to the platform for free). The platform is facilitated by the Department of Foreign Affairs and Trade (DFAT) of Australia and Deutsche Gesellschaft für Internationale Zusammenarbeit (GIZ) GmbH, on behalf of the German Federal Ministry of Economic Development and Cooperation (BMZ). It is supported by the United Nations Development Working Group of the G20 and the Social Protection Inter-Agency Cooperation Board, (SPIAC-B). It is developed and hosted by the IPC-IG. Read more about the achievements and activities of the platform here. socialprotection.org is the first unbranded platform dedicated to social protection issues, promoting and disseminating a plethora of content from a wide array of stakeholders in the field. Among its distinguishing features is the fact that it is an unbranded, organic collaborative space, where people interact directly to share knowledge. On the subject of knowledge-sharing, on 27 September our colleagues and partners at socialprotection.org will host the webinar titled "Integrating the Graduation Approach with Government Social Protection and Employment Generation Programs: sharing experiences from Asia and Africa". In this webinar organised by DFAT, GIZ and BRAC, speakers will reflect on key issues including the reasoning behind adopting the Graduation approach by these governments; how the Graduation approach adds value to cash transfer programs; what challenges they had to overcome, the roadblocks to scaling up and so on. 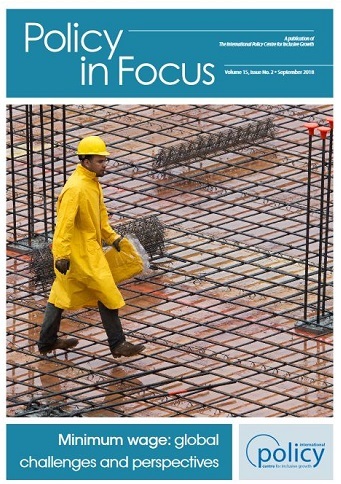 Graduation Approach was the theme of a previous issue of Policy in Focus, read it here. To register free for the webinar, click here. The IPC-IG hosts the socialprotection.org platform. IPC-IG Researcher Charlotte Bilo participated in the International Conference "What works for Africa’s Poorest Children”, held in Kampala, Uganda, form 10 to 12 September. 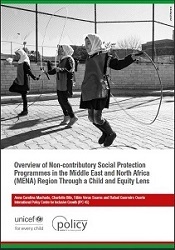 She presented the Centre's work on non-contributory social protection in North Africa, most notably the study, jointly produced with UNICEF, titled "Overview of non-contributory social protection programmes in the Middle East and North Africa (MENA) region though a child and equity lens". The conference gathered policy and research experts from all over the world and was organised by Uganda's Economic Policy Research Centre, UNICEF Uganda and the University of Manchester. Since early 2018, the IPC-IG has been supporting the Government of Kenya in the revision of the country’s Social Protection Policy. Between 26 August and 7 September, Fabio Veras (IPC-IG Research Coordinator), Pedro Arruda (IPC-IG Research Associate), and Judy Mwangi (IPC-IG consultant) met with national and local government officials, representatives from development partners involved in the implementation of social protection programmes, and some programme beneficiaries in Nairobi, Kitui, Kyuso, Kabarnet, Marigat and Naivasha. 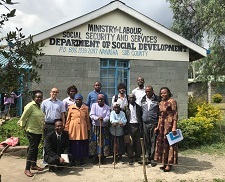 The IPC-IG team also participated in a 3-day stakeholder consultation workshop in Nakuru, organised by the Social Protection Secretariat of Kenya’s Ministry of Labour and Social Protection, to discuss what has been done so far within the scope of the project and obtain more detailed inputs to improve the country’s Social Protection Policy. This project is part of a UN-to-UN agreement between the IPC-IG and UNICEF Kenya. 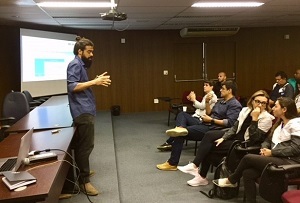 IPC-IG researchers Mariana Hoffmann and Wesley Silva travelled to Rio de Janeiro on 6 September to attend a meeting with representatives from the municipal government’s Sub-secretariat of Sports and Leisure (SUBEL) and Nike. The meeting’s objectives were to present and discuss the main findings of the baseline assessment of the Olympic Villages project, which are community sports centres located in disadvantaged areas in the city of Rio de Janeiro. Nike has partnered with the local government to improve sports classes that are offered free of charge to more than 50,000 people, including children, youth, adults and elderly people. The baseline study developed by the IPC-IG is part of the project’s monitoring efforts and includes a set of indicators to measure its progress.